Bleurg. 5:00am wake up call again for our flight back to Cairo. Then from the airport to the buses, and on to Memphis – the first capitol of Egypt. Believed to be founded by the first pharaoh of the first dynasty, that makes Memphis (modern-day Mit Rahina) five thousand years old! 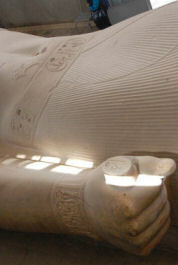 Did I mention that Rameses II has won my vote for Most Self-Absorbed Pharaoh? Anyway, in Memphis we were able to see RII once again, in all his glory carved to perfection. The colossal statue was prone, and we were able to get a close look. As I stood beside him, I realized his head was taller than my whole body! The details in this version of RII are as interesting as ever: knife in his belt so it’s at the ready, just in case. A scroll in his right fist. Left leg forward for action and strength. Outside the building that houses RII, we were able to walk the grounds of the open-air museum, and see an alabaster sphinx. 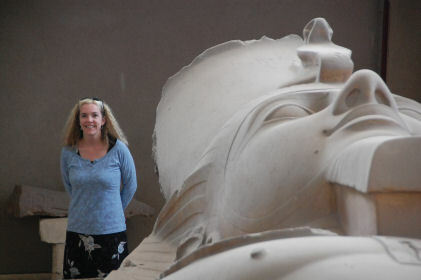 It has the body of the lion and the pharaoh’s face has not been identified. There is another huge statue of RII outside, and this one seems to have only the white crown of Upper Egypt, which is interesting. Nekhbet. To show unification and support of all Egypt, pharaohs wore both crowns together. The two lands of Upper Egypt and Lower Egypt could also be embodied in the cobra goddess and the vulture goddess together on the forehead of a crown. The Ankh, referred to as the “key” frequently by our guide, is a common symbol for life in hieroglyphics. Gods are often depicted holding one. Hossam sketched out a map of Egypt to illustrate where the Ankh symbol came from. Start with your pen at Cairo and draw a loop around the Nile Delta. That’s Lower Egypt. Draw a straight line south from Cairo along the Nile to represent Upper Egypt. Then draw a horizontal line to divide the two. The true origin of the symbol is unknown to Egyptologists, and Hossam’s version is one I haven’t seen anywhere else. 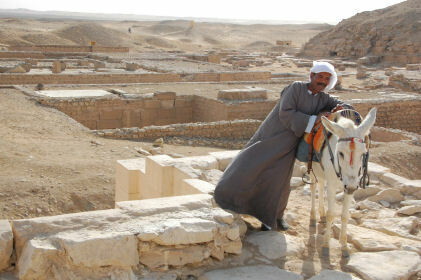 Next we traveled to Sakkara. We stopped first at the beautiful and modern Museum of Imhotep. We saw statues carved in wood rather than in stone. My favourite display was an ancient blueprint used by an architect in the planning of a temple at Sakkara. Hieroglyphics and outlines painted onto a flat rock – too cool! Tara liked seeing the mummies. The necropolis of Sakkara doesn’t look like much in 2010, but its implications are impressive, and the history here is also awesome. 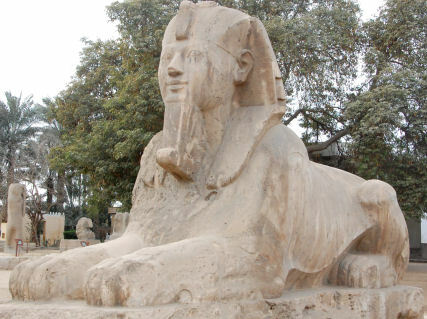 Sakkara was originally part of Memphis, revealing that Memphis originally covered a vast area. 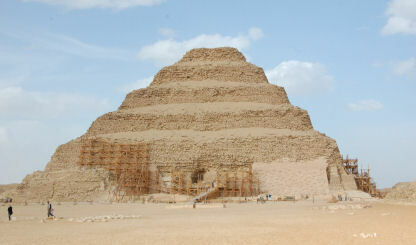 The main attraction for us was the step-pyramid, the oldest known Egyptian pyramid. Prior to pyramids, important people were buried in mastabas, or raised areas of earth with flat tops, erected over a grave. A particularly innovative priest and architect named Imhotep had the idea of building successively smaller mastabas, one on top of the next for king Djoser. When complete, it was the largest man made structure in the world at the time (2600 BC). There is a theory that it may have been an attempt to reach up toward the sun god, Osirus/ Amun-Ra. Classic pyramids that followed the step-pyramid design are said to be built to represent the rays of the sun, coming down from Osirus and giving life to Earth. Sakkara contains many of the older mastabas. We walked past a row of them and ascended a ramp to a high point, where we were able to look to the south and see the “bent pyramid.” In the evolution of the classic pyramid style from step pyramids, there was a pyramid where construction began at one angle, then the engineers changed orders, and the remainder of the pyramid was completed with different angles. The bent pyramid is believed to be the oldest pyramid of the newer design with smooth sides. From this same high point, if we turned around to look north, we could see the Giza pyramids again. Also in Memphis we visited a carpeting school. Hossam explained that it is a project both to give children of the area a trade, education, and also to create great carpets. 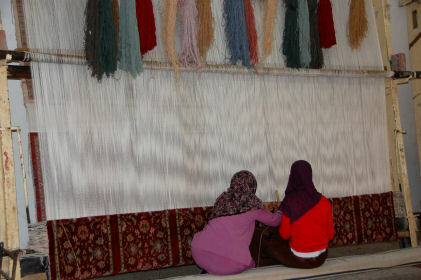 Sales of carpets fund the project, and the education of the children is theoretically an investment in the future of Egypt. Apparently the founder told parents that he would offer their children a chance to earn wages and learn a trade, but the children had to live there at the school, and the parents had to agree to let them get an education. The kids work 4 hours a day, learning to tie knots in carpets, and also attend school to learn to read and write and other basics, which poor Egyptian children rarely learn. They get spending money for their free time, and can leave the school whenever their parents wish them to leave. Inevitably, after viewing the students at their work, we were led to the showroom. Prior to the visit, I had no plans to purchase a carpet, even though I dearly love good carpets. Tara changed my mind when she reacted to the carpets and told me how much she wanted to have one. 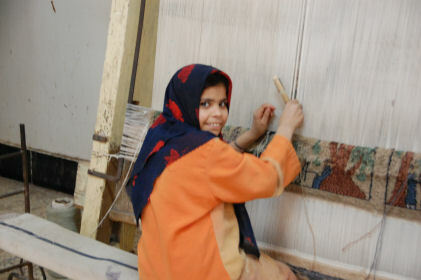 She unknowingly helped her cause when her eye was consistently drawn to the wool weaves (the least expensive type). I enlisted the bargaining expertise of fellow traveler Marty, who happens to be a carpet salesman back home. Marty did his work, and then we talked to Hossam who approached the floor manager, and got us a stellar deal on a wide runner carpet with excellent colours and design. With our prize in hand, we boarded the bus and were delivered to our next hotel, at the Cairo airport. We got all our instructions for the return home the following day, and by 6pm we had our keys and were released.